Today's brides are looking for designs that are interesting and affordable. The choices for unique flower designs are endless. Use your imagination, talk to some of your friends, look through bridal magazines and attend a bridal show. Whether you choose to go with simple or elaborate floral designs depends upon your budget and your individual taste. If you want to achieve a formal elegant look, your bridal bouquet can be designed using all white flowers, such as, white roses, lilies, white carnations or orchids. Using white satin ribbons compliments a formal bouquet and adds a simple texture to the design. 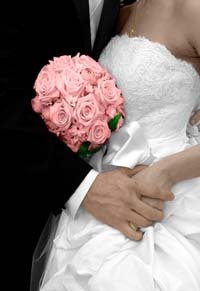 Creating an all white bouquet will direct all attention onto the bride rather than on the flowers. 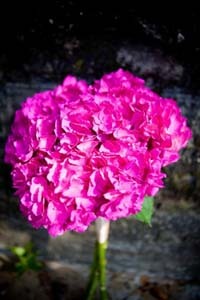 Wedding Flower Designs Ideas for your bouquet. Some brides prefer to have their bouquet stand out and this can be accomplished by choosing flowers that enhance your overall color scheme and the color of the bridesmaid’s dresses. Using colors that match the bridesmaid’s dress will have a subtle look and using contrasting colors will call attention to the bouquet. Having your bouquet hand tied, and wrapping the stems with complimentary ribbon will create an elegant designer look. A more carefree design would be to have the ribbons flowing from the bouquet. Bridesmaid’s bouquets should be lovely but less elaborate than the brides bouquet. Each attendant’s bouquet can compliment her dress and set her apart from the rest of the guests. The bridesmaid's bouquet can be a single long-stem flower, a basket of flowers or a smaller version of the bridal bouquet. 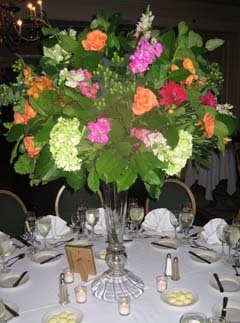 Floral centerpieces spark conversation, add energy and beauty to a room. 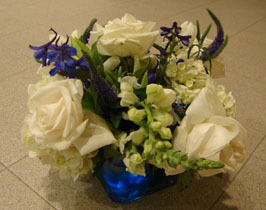 The design of your arrangements can be chic and elaborate or traditional and simple. It all depends on the statement that you want to make. The colors can compliment your color scheme or you can choose to have the centerpieces blend into the décor of the room. Need more Wedding Flower Design Ideas? How about trying this easy and inexpensive DIY centerpiece? 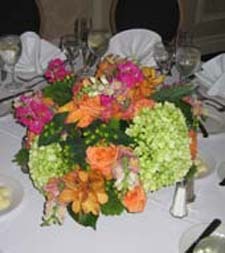 Items that you will need to create the above centerpiece. Wash and dry the square container, then add the LED lights (turn them on) and blue stones. Fill the container about 3/4 the way with water. Make a boxed pattern with the florist tape and begin adding the flowers. If you're not certain which floral design you prefer, ask a friend, family member or florist to help you design your bouquet and table arrangements. Choosing any of my wedding flower design ideas will help create a unique look that will certainly impress your guests and enhance your wedding. It's a good idea to learn all you can about wedding planning. Start here to get great tips and learn my secrets!